Increases memory and is a cognitive enhancer, by increasing Long Term Potentiation (LTP) and synaptic plasticity (R). The mechanism is via NMDA activation (R). Treatment for Schizophrenia (R), Alzheimer’s (R), Bipolar (R), Depression (R), ALS (R), Parkinson’s (R), Anxiety (R) Dementia (R) via NMDA activation. Decreases cholesterol just as much as some statins (R). The pathway that increases cholesterol synthesis is inherently inflammatory, which is why statins are considered powerful anti-inflammatory drugs. The cholesterol itself isn’t inflammatory; rather, enzymes in the pathway are (R). I recently bought this lemon juice from my corner grocery. Looking at the ingredients, I noticed sodium benzoate and sodium sulfite. I commonly see potassium sorbate in a lot of foods, too. I generally try to stay away from food additives because they can have an effect on gut flora, theoretically at least. Normally I try to get better quality foods from the health food store but I figured some sodium benzoate once in a while won’t kill me. Recently, I became interested in researching therapeutic options for autoimmune conditions because of its growing prevalence and our increased understanding that more and more diseases are of autoimmune origin. See a list of autoimmune diseases, which seems incomplete based on my research. Anyway, I came across a few interesting studies that demonstrated how sodium benzoate can dampen inflammation (R) and help autoimmune diseases (R). Sodium benzoate (NaB) actually is a derivative (or metabolite) of cinnamon. While not as promising, studies also show that potassium sorbate (sorbic acid) and sodium sulfite can suppress Th1-type immune responses, which has an anti-inflammatory effect. Interestingly, sodium benzoate decreases cholesterol, too, in the same manner, that statins do – by inhibiting an enzyme called HMG-CoA reductase. It’s in this manner that it has an anti-inflammatory effect. It counteracts autoimmune diseases by decreasing inflammation (R). It acts via inhibiting T cell proliferation, the Mevalonate pathway, iNOS, NF-kb, TNF-α, IL-1β, Th-1, adhesion molecules and by increasing Tregs (R). It inhibits iNOS via NF-kb inhibition. Inhibiting iNOS reduces nitric oxide (NO), which has a host of downstream (or domino) effects. For example, NO increases CD11b, a protein on cells that binds to ICAM-1 and complement C3bi, which are other proteins that cause inflammation. In various neuroinflammatory diseases, the increased CD11b expression corresponds to the severity of microglial activation (R). NO also increases MHCII and other “co-stimulatory molecules”, which are other proteins on cells that stimulate inflammation (R). In addition, it increases a protein called “GFAP.” In various neuroinflammatory diseases, the increased GFAP expression corresponds to the severity of astroglial activation (R). So by NaB inhibiting NO in astroglia (a type of brain cell), it decreases these proteins. NaB also markedly inhibits the expression of other receptor proteins on cells called “integrins” (VLA-4 and LFA-1: α4, β1, αL, and β2), which are located on T cells. These receptors make it easier for T cells to activate and attack our own tissue, so by inhibiting them, we decrease our risk of autoimmunity (R). Last, NaB inhibits “adhesion molecules” such as E-selectin and P-selectin, ICAM-1 and VCAM-1, which allows the immune cells to attach and roll along the brain barrier and get into the brain. NaB inhibits these adhesion molecules (R). Sodium benzoate is also a potent inhibitor of an enzyme called D-amino acid oxidase (DAAO). Less of this enzyme is a good thing because DAAO breaks down d-serine, resulting in less d-serine and therefore less activation NMDA receptors (d-serine activates NMDA) (R). Less activation of NMDA receptors has been found to be a contributory factor in multiple chronic, cognitive-based disorders. While researching this article, I was surprised to find 2 double-blind placebo-controlled clinical trials of sodium benzoate with positive results for schizophrenia and Alzheimer’s. In schizophrenia, D-amino acid oxidase has been connected to the brain D-serine metabolism and to the regulation of the glutamatergic neurotransmission. In a postmortem study, the activity of DAAO was found to be two-fold higher in schizophrenia (R). 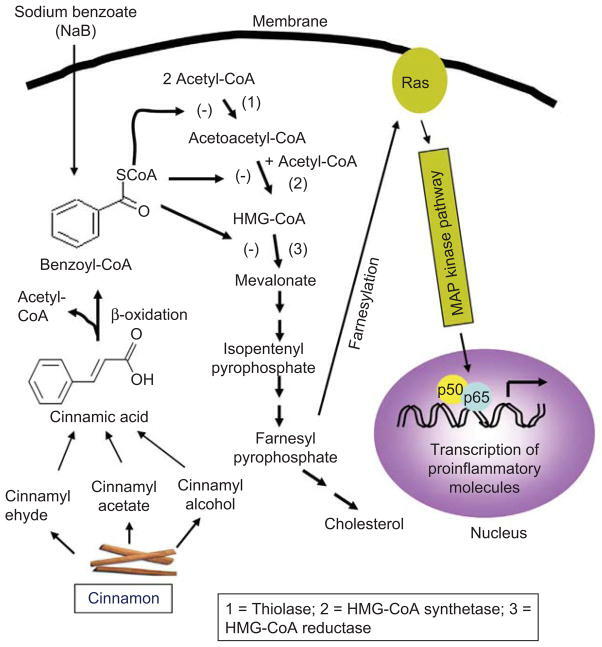 By inhibiting this enzyme (DAAO) benzoate is working via a completely different mechanism than its anti-inflammatory and cholesterol-lowering role. All of the mechanisms are pretty common with broad anti-inflammatory herbs. For example, bioavailable curcumin and tea reduce inflammation by the same mechanism’s, for example. By increasing “Tregs” the immune system start to tolerate its own tissue and reverse the autoimmune disease process. This diagram may look scary, but it isn’t. If you follow the arrows from sodium benzoate, you’ll see it inhibiting enzymes HMG-CoA. These enzymes work like dominoes where one enzyme leads to the activation of another. Eventually, they activate proteins called transcription factors that increase growth via increasing inflammation. What really got me interested was when I found this study, which showed that lower DAAO also increases Long Term Potentiation (LTP) and therefore memory (R). This cognitive enhancing effect works by increasing synaptic plasticity and NMDA receptor activity (by regulating d-serine concentrations) (R). NaB also dose-dependently induced the expression of BDNF and NT-3 in primary human neurons and astrocytes (R) and increased volumes of the thalamus, amygdala, and brainstem in a patient with major depression (R). I couldn’t access the full schizophrenia study, but the Alzheimer study used 250-750mg, a dosage that isn’t likely to be achieved with food. I haven’t been able to find the average consumption of benzoate, but the WHO says the acceptable daily intake for a 70kg person to be 350mg. It’s likely that the average person gets much less than this. If I had to take a wild guess, sodium benzoate is probably less than .1% of my lemon juice (they don’t disclose how much). With a serving being 5ml and therefore about 5g, .1% would equal 5mg per a serving. Taking 5 servings a day, I’d get 25mg of the stuff. Not quite medicinal, but a dosage I’m very comfortable with, given there’s probably much I don’t know about it. Beware that if you are one of those people that get sick all the time, ingesting sodium benzoate might not be the best strategy. Sodium benzoate decreases nitric oxide(NO), which has some positive effects on the body such as fighting infections, decreasing blood pressure, increasing circulation and athletic performance. The negative effects of NO are that is inflammatory and is a free radical, which increases the oxidative stress burden in the body. There is some concern about NaB increasing ADHD in kids. I don’t think there’s any evidence for this since all the studies I’ve seen are confounded by also consuming it with other additives and probably loads of sugar. Even so, according to this study, there seem to be no significant associations between artificial food colorings (AFCs) and a preservative (sodium benzoate) on Chinese children’s behavior at the age of 8 to 9 years. And then there’s another study in college kids that claims there’s a relationship, but I can’t take this study seriously because of the more sodium benzoate these kids drink the more junk they’re taking in as well, and I don’t believe that you can disentangle these variables. In a situation like this, I place more value on mechanistic studies and randomized controlled trials. Another concern I’ve seen is that when mixed with certain other ingredients like vitamin C and metals ions (iron, copper) benzene – a carcinogen- is produced. This doesn’t seem to be significant, though, because taking the worst example found to date of a soft drink containing 87.9 ppb benzene, someone drinking a 350 ml (12 oz) can would ingest 31 μg (micrograms) of benzene, almost equivalent to the benzene inhaled by a motorist refilling a fuel tank for three minutes. The amount of benzene is regulated by authorities and levels are significantly lower. Another concern is carnitine deficiency from benzoate since increased urinary excretion was found in kids taking massive dosages (5g per a day). This is a non-issue when consumed in the amounts found in food. Even the clinical trial with Alzheimer‘s used only 250-750mg, a dosage much higher than that found in food. I probably won’t be going out of my way to ingest it, but I will gladly consume it since it also has additional conveniences like the food being cheaper and lasting longer, in addition to the potential health benefits. Whereas before I was very hesitant about ingesting foods and beverages with it, I’m much more willing now that there’s a significant potential gain (besides price and convenience). I will consume foods with it in moderation, though. I will also continue consuming generous amounts of cinnamon (6g a day). For me sodium benzoate (say from little Caesar’s pizza sauce or doctor pepper) causes intestinal pain and distress within an hour and lasts about 2 days. Completely takes me down. Potassium Sorbate has a similar but delayed effect. It starts less than a day after ingestion and lasts about a day. I feel compelled to comment. Sodium Benzoate has an adverse effect on my body. This article reads as if it is a wonder ingredient. Be cautious. Great post with some surprising findings! One thing you didn’t go into was the effect of Sodium Benzoate on gut flora, which is my main concern with preservatives. Does SB make it to the large intestine and if so, what are it’s effects on commensals? The effects of SB on schizophrenia are interesting, as I suspect a gut-brain link, perhaps involving bacterial neurotoxins, to be a potential contributory factor in at least some cases. Is Magnesium Stearate safe dr macula says it not safe? Sodium benzoate, a food preservative, induces anxiety and motor impairment in rats. Sidenote: Do you think that examining the full spectrum of effects of potential enhancing substances makes you paralyzed? Do you question yourself too much while trying to manage every possible side effect? I read that study before and it’s meaningless because of the dosages used. Nice find. Suggested dosage? Do you think it can be a substitute for Aspirin? I’d rather not use it as a supp because it’s in a lot of food. I’m just going to eat the food it’s in if it’s healthy otherwise and I happen to want that food. It’s complementary to aspirin. Aspirin is more of a cox-2 inhibitor, though there’s overlap to like iNOS inhibition.